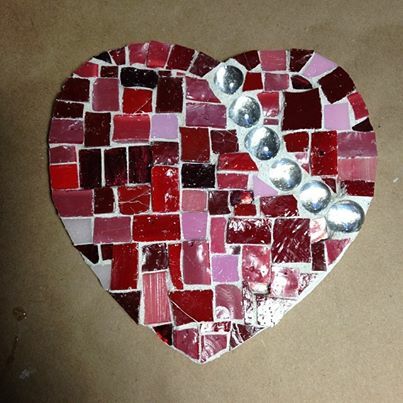 I've been working on a new hear mosaic wall hanging. I wanted to use mix of materials to create an interesting texture and design. I used stained glass, Italian smalti. and glass beads. The trouble that I faced with this is that Italian smalti is a handmade glass and natural air bubbles are a part of the glass. This causes the grout to get caught in the air bubbles, which is why this type of glass is usually not grouted. I ended up being able to scrape out mostly all of the grout in the Italian smalti (I used some dental picks to be able to really get into the crevasses) and the little grout that was left, I ended up liking because it created a great textured look.